There are a lot of things inspired by wild animals this spring. One of my favorite animals is the alligator. Many people mistakenly assume that the Lacoste brand logo is an alligator. It's actually a crocodile! 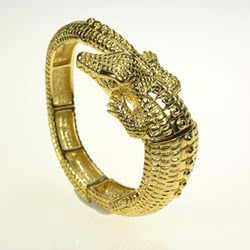 Kenneth Jay Lane Alligator cuff. Talk about personality! This fun gator cuff stretches to fit any wrist and is a great statement piece. By the way, Kenneth Jay Lane is on GILT today. Get your invitation to this members only site that offers sample sales online every day. Of course, I can't post a feature about animals without going "wild" with something from Lilly Pulitzer. 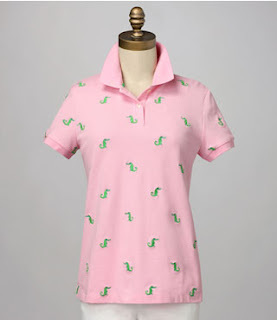 The embroideries from Lilly Pulitzer are always some of my favorite pieces of the collection and I'm thrilled with this adorable gator embroidered polo. Pink Gators note cards from Whitney English. These can also be ordered as invitations and stationery. Too cute. Gators and my favorite colors. It doesn't get much better than this. 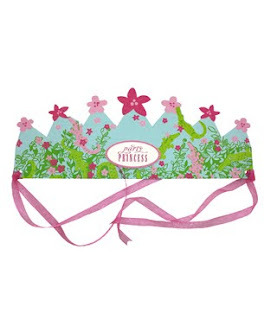 Princess crown from Lilly Pulitzer. This is so adorable! Would it be out of line for me to want to wear this to MY party even though I'm not a little girl? I love it. I adore the gator bracelet. On my wishlist! I do believe I will have to get the cuff!!! All 4 of my kids love alligators!! what great finds, love the cuff especially. Very cute! Glad I found you! 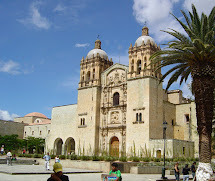 Now following from Friday Follow - hope you'll drop by soon! Found you on Friday Follow. 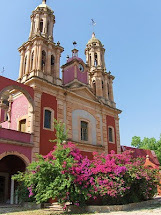 Love you Blog! Can't wait to follow. I recently moved up north from Florida, and I must admit, I miss my alligators!! Thanks for these cute (harmless!) ones! Hi! 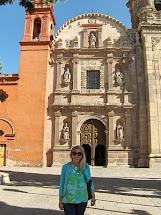 I'm new to your blog and I'm so glad I stopped by, it's terrific! I'm your newest follower! Cheers! Stoppin' by to say Happy Friday Follow. I already follow! I'm in love with the safari trend! And I'm so jealous you got to the Pink Palace I go to school right around there and am yet to go! Just over from FF and am one of your newest followers. Gators! My hubby is from Tallahassee! 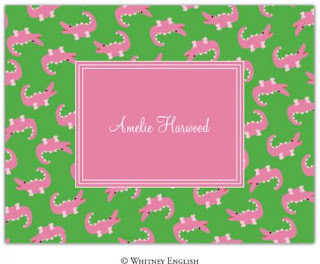 I love the pink gators on the note cards and that Lilly crown! Cute pink and green polo is right up my ally. I would love to have that! What lovely finds!! YOu've done well! I'm sitting with my cup of tea and catching up with some Friday Follows. I definitely think you should wear the crown - it's adorable for any age and when do we deserve to do what we want more than on our birthday!